SellerCloud stands virtually in a class of its own, as a breakthrough, single-source management solution, encompassing every aspect of your merchandise flow from the moment items are purchased to the time they are accepted – or returned – by the customer. SellerCloud is built by in-house development team to serve the needs and objectives of each of our clients' business and operations setup. Every aspect of the business model, from the warehouse operations down to invoice formatting, is taken into account in the setup and configuration of the software. 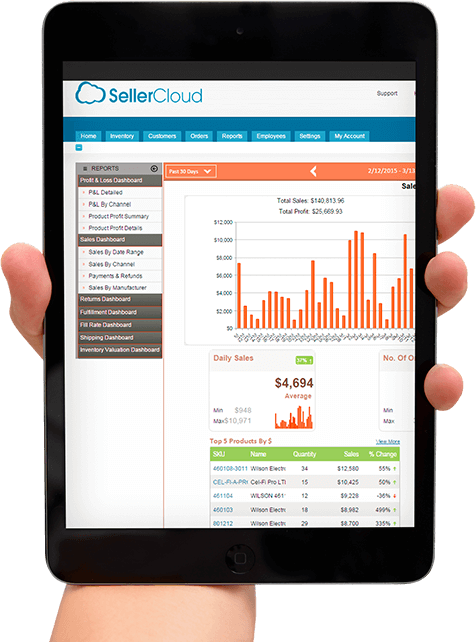 SellerCloud eliminates the need for reconciliation between software programs or departments. As a true single-source software, information entered at any point in operations is communicated directly to all in links in the chain of command. The leverage provided by this optimum level of integration offers an unprecedented level of control of your company and your bottom line. Consider the expediency and convenience of managing every aspect of your operations, from pricing to warehousing to order processing to shipping, all with a few easy clicks of your mouse.